Sometimes it’s the simplest of things that make me happy, this shot for example. A bright summer’s day, lying down in the park on lush grass with my camera in hand, merrily shooting away. 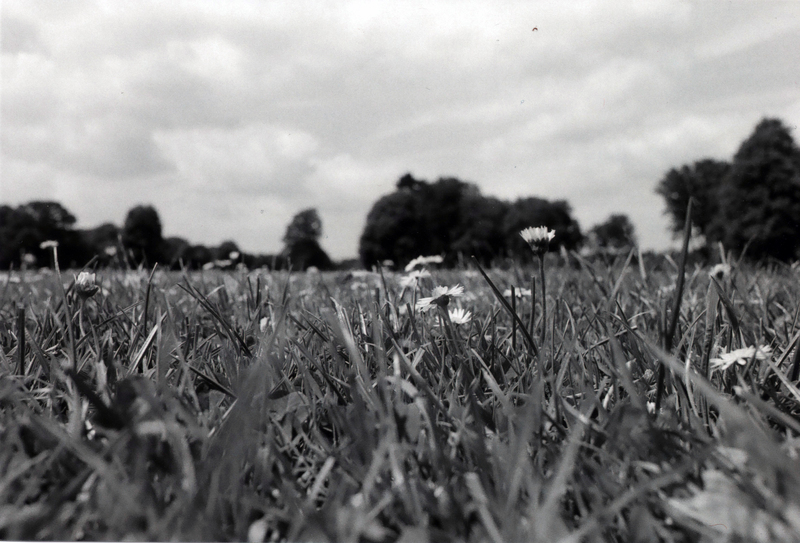 I like how the daisies that are slightly off centre to the right of the photo are grouped together making a nice focal point, and in focus while the foreground and background grass surrounding them are nicely blurred. At this angle for the shot the field seems to stretch on forever, without the trees in the background I think the only thing stopping the field would be the horizon. I think what makes me most pleased about this photo is just the simplicity of it, nothing fancy and a shot that shows the ease of accessibility of photography, anyone armed with a 40 year old camera and a fresh roll of film can make things as beautiful as this. Taken on a Nikon FM with 28mm lens using Ilford HP5 ISO 400 film.